This has become a very popular question lately. I've gotten a number of emails from people who have read through plenty of introductory Wiccan and Pagan material and have no idea where to go next. Nobody seems to be able to find 'advanced' books on Wicca. I do have a few book suggestions. Edain McCoy has a new book out called "Advanced Witchcraft ". I've not read it, but it might be worth checking out. "Progressive Witchcraft " by Janet Farrar and Gavin Bone is a good book as well. It's still focused on introductory material, but gives it an updated perspective. But I have to admit, there are few books out there that suit this 'next step' phase. That's because in order to be advanced, the books must go past general Wicca. Think about it like shopping for a cookbook. There are thousands of beginner cookbooks on the market, but you rarely see books titled "Advanced Cooking". Once you get past the beginner stage, most people begin to branch out. That's when you start buying more precise cookbooks, like pastry baking, BBQing, candy making or beer brewing. I feel that is a good direction when studying Wicca, Paganism or witchcraft as well. Instead of trying to step upwards, think about walking sideways instead. Think about non-general topics that interest you and delve into those. History - Learn more about the roots of modern Wicca, about the lives of the people who started it, and don't forget all of the ancient history behind Pagan cultures. Gods & Goddesses - Even if you have a preferred pantheon, there is so much rich history and mythology surrounding the Deities of all cultures and time periods. The Sabbats - Take a deeper look into the holidays of the year. Really get in touch with the reasons for celebrating and the age-old traditions that are still followed today. Practical Skills - Why not put the books aside and learn what you can directly from the Gods themselves? Improve your meditation skills, try to spend more time doing rituals in sacred space, or master some form of divination (Tarot, runes, scrying). 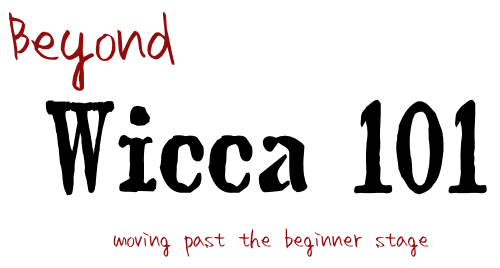 Non-Wiccan Paths - Even if you are comfortable with Wicca, you can still learn quite a bit if you take the time to explore some other Pagan beliefs, like Santeria, Druidry, Celtic or Greek paths. Hands-On Crafts - Try growing your own herbs, blending your own oils, making a deck of Tarot cards or sewing a special ritual robe. These may seem trivial but knowledge can be found even in light-hearted tasks. Of course, these are only some suggestions to help you advance your learning. You may find that you are drawn in different directions entirely.